The University of Scranton will hold “A Celebration of Community: The Inauguration of Rev. Scott R. Pilarz, S.J., as The University of Scranton’s 27th President” Friday, Sept. 21, at 11 a.m. in the Byron Recreation Complex. The University of Scranton will hold “A Celebration of Community: The Inauguration of Rev. 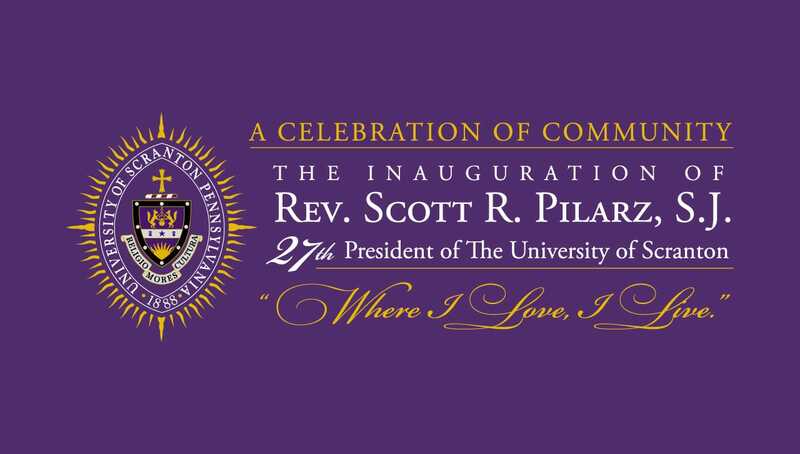 Scott R. Pilarz, S.J., as The University of Scranton’s 27th President” Friday, Sept. 21, at 11 a.m. The ceremony, which is open to the public, will take place in the Byron Recreation Complex on campus. A luncheon will immediately follow the ceremony on the Dionne Campus Green. In addition to the ceremony, a Mass in Celebration of the Inauguration of Father Pilarz will take place on Saturday, Sept. 22, at 4 p.m. in the Byron Recreation Complex. The University’s Inauguration events will conclude with the “Family Weekend President’s Concert: Celebrating the Inauguration of Scott R. Pilarz, S.J., as the 27th President” at 7:30 p.m. in the Houlihan-McLean Center. The concert, which is free of charge and open to the public, will feature The University of Scranton Concert Band and Concert Choir with special guest Wycliffe A. Gordon, H. ’06. The Inauguration will include the world premiere performance of “Don’t Waste Love,” which was composed by Joshua Rosenblum and commissioned especially for Father Pilarz’s Inauguration as the University’s 27th president. The piece will be performed by the University’s Concert Band and Concert Choir and will be conducted by the composer. The text of “Don’t Waste Love” is drawn from inspirational words from Father Pilarz’s addresses to the University community made during his first tenure at Scranton, combined with phrases from poems and writings by other members of the Society of Jesus, including St. Robert Southwell, Gerard Manley Hopkins, S.J., St. Ignatius of Loyola and Pope Francis. The piece will also be performed at the concert Saturday evening. A medieval and Renaissance literature scholar, Father Pilarz has published a book about St. Robert Southwell and a quote of his, “Not where I breathe, but where I love, I live,” is engraved above a prominent entrance to the DeNaples Center.